Tom Ewing presents fans of bluegrass music with an in-depth and long-awaited biography on the Blue Grass Man himself, Bill Monroe. 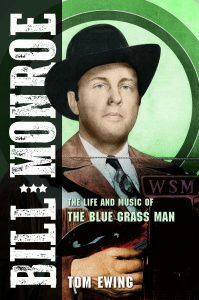 Called “insightful” by The Wall Street Journal, Bill Monroe: The Life and Music of the Blue Grass Man covers Monroe’s story from birth through childhood and adolescence, his beginnings and growth in the music industry, and his relationships with the people that came in and out of his life. Read the excerpt below for a glimpse into Bill’s early life, balancing work with his love of music. Possibly delaying his decision to go was a brief romance. All he ever said about it was, “I never had a date ’til I was eighteen. I never kissed a girl ’til I was eighteen years old. I didn’t know what I was doin’.” It may have inspired many “what ifs” in the years to come. Shortly after they returned to Detroit, Birch and Charlie were laid off again, so they and brother John headed back to the Calumet. A letter home may have convinced Bill to join them in Whiting, where they could all live together cheaply. On the morning of Wednesday, April 30, 1930, after the crops had been planted, Bill said goodbye to Uncle Pen, whom he had lived with for nearly two years. Bill never spoke of this parting, but it couldn’t have been easy: “He done a lot of good things for me. A man that old, and crippled, that would cook for you and see that you had a bed and a place to stay and something for breakfast and dinner and supper, and you know it come hard for him. . . . Maybe, if I hadn’t heard of him, I’d have never learned anything about music at all.” Bill carried his suitcase and tater bug (stowed in a pillowcase, it’s said) down to the Rosine depot and was met there by Speed. “It never hurt him so bad as anything in his life to put his little brother on a train goin’ north,” said Frances Harvey, who had heard about that morning. With tears in his eyes, Speed gave Bill a twenty-dollar bill and sent him on his way. “I didn’t have music on my mind. I went up there to work,” Bill said. But finding a job wasn’t easy; by the end of June, he was still unemployed. Charlie was working at the Sinclair Oil Refinery in East Chicago, southeast of Whiting, and in July he used his influence as a standout player on the companybaseball team to get Bill hired: “[The] manager of the team was my boss at the plant—Max Tucker. . . . I said, ‘Max, I’ve got a brother here, eighteen years old. Now, he’s not well. Now, if we can’t get him through that gate out there, I’m going to have to leave Sinclair’s ball team and company.’” Charlie played on Tucker’s sympathies, using Bill’s cross-eyed appearance to claim he wasn’t completely normal. But it worked, and he was given a job. At that time, Jimmie Rodgers was in Hollywood, California, recording for Victor Records. He had been dubbed “America’s Blue Yodeler” for the series of “blue yodels” he’d recorded, combining his black-sounding blues singing with a seemingly effortless yodel (which, for some early listeners, confirmed he was white). On July 11, 1930, he recorded a new one, “Blue Yodel No. 8,” subtitled “Mule Skinner Blues,” and when it was released, Bill’s avid record-buying brothers would’ve bought it immediately. Bill would’ve been easily drawn to it, with its frank mention of using a whip “on a mule’s behind” and of working for “a dollar and a half a day,” something he himself had done recently. Bill was assigned to “the barrel house” at Sinclair, cleaning and stacking empty oil barrels. In later years he described his job, which, like logging in the 1890s, seems to define hard work. barrels with gasoline. Some of them weighed one hundred and fifty pounds. I needed the money to take care of everything—pay our rent and buy groceries. streetcar to go to work, and my brothers would go out and pick up my check. After work, Bill was surrounded by new worlds of entertainment: movie theaters with “talking pictures” (which he had not yet seen), nightclubs, vaudeville shows, dance halls. Even old familiar radio seemed new, with numerous local stations coming in loud and clear, unlike the static-filled signals he’d heard at Crowder’s store. Most powerful was WLS in nearby Chicago, then a 5,000-watt station owned by the Prairie Farmer newspaper. have heard they were all earning a better living than he was by just singing and playing on the radio. After most of the Monroes were employed, they began looking for a new place to live, closer to their jobs. That fall they moved into an apartment building in East Chicago at 4714 Magoun [Ma-goon] Avenue, near the busy intersection of Chicago Avenue and Forsythe Avenue (now Indianapolis Boulevard). It was a short streetcar ride for Bill and Birch to Sinclair, and Charlie had only another half mile farther north to go to get to Standard Oil in Hammond. The Queen Anne factory in Hammond was less than a mile to the west of the apartment building for Maude and Bertha. Brother John, meanwhile, couldn’t find work and returned to Rosine in November 1930.
top of his voice as they traveled around the huge Sinclair facility. As the Depression deepened, two new duet-singing duos emerged in 1931—the Delmore Brothers (of Alabama) and Karl and Harty (Karl Davis and Harty Taylor of the Cumberland Ridge Runners)—and both recorded near the end of the year. But sales were limited, and both would have to wait until 1934 before they had another record released. In early 1932, the news from home was mixed. Uncle Andrew, J. B.’s general store partner, died on February 1 of cancer and double pneumonia at age seventy-two. Then, on March 27, thirty-four-year-old brother John, once again farming, married thirty-two-year-old divorcée Clara Wilson (not related to Clarence Wilson). But there is no indication that the Monroes of East Chicago returned home during this time. That March, the WLS Barn Dance moved from a small studio to the 1,200-seat Eighth Street Theater, to accommodate the crowds thronging to see it. Caught up in the rising “hillbilly fever,” little WWAE began to increase its country music programs. Live shows titled Old Time Music or Old Time Tunes were broadcast three to five times a week, and a weekly Old Time Midnight Frolic was added on Wednesday nights. Birch, Charlie, and Bill undoubtedly guested on these shows, and, before long, were approached about doing a show of their own. Read more in Bill Monroe: The Life and Music of the Blue Grass Man!